I was amazed by this movie. The fights are in the now stereotypical style of wire and flying acrobatics, but the story itself and the cinematography are incredible. 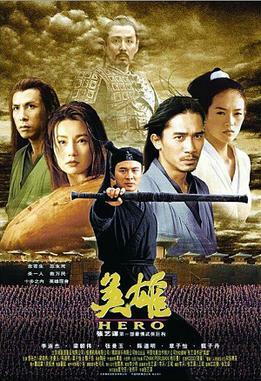 The film is set just before the unification of all of China under one ruler, at the point when he was conquering the other kingdoms in order to unite them all. Three assassins are after him and he offers huge rewards to whomever can kill them. One man, Nameless, does so and comes to meet the king. In the style of Roshomon, there are different stories to be told. Initially, there is the false story, the one Nameless spins to get closer to the king, then there is the Kings story of what probably really happened, and finally Nameless corrects the kings story to reveal what actually happened. For each telling of the story, for each interaction between people, the colors of costumes, settings, and locations changes slightly. For example, in the first telling the initial meeting between Nameless, Snow and Broken Sword, everyone is in Red. In the second they are all wearing Blue, and in the final telling they are all wearing white. It's incredible coloring, and the story itself, and the moral behind the telling is quite amazing, especially in today's times. It can be hard to grasp though. A beautiful film about history, with a modern application if you look at it.